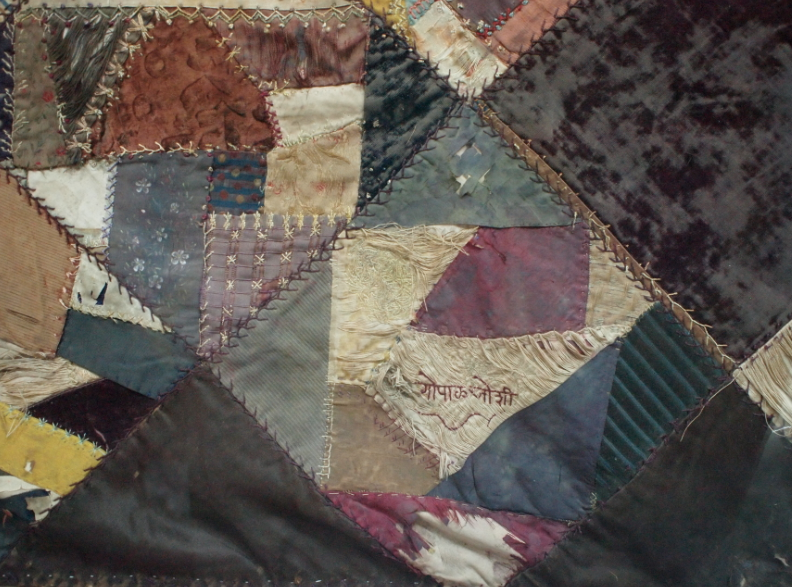 On the third floor of the Kelkar Museum in Pune, in the corner of the room where articles of clothing are displayed, is a quilt. Presented to the museum by ‘Wrangler’ Paranjape, this quilt is possibly the only physical article known to have been in the possession of the remarkable Anandibai Joshee (1865-87). The image on the right is from a photograph I took a few years ago when a friend told me about its existence. The description provided at the display says that the quilt was a community effort by Anandibai’s friends to mark her return to India. As one can see, it contains scraps of cloth that must have formed part of everyday objects and clothing- it was difficult to not be moved- one irregular piece has mirrorwork , while another contains the name of her husband, embroidered in what must surely be her hand. I have not been able to find much about this in what has been written about Anandibai’s life, both in the popular press as well as in scholarly journals. As things go, maybe quilts are not that important. But as one of the first Indian woman to be trained in western science, her story is iconic and inspirational, and in its own way as remarkable and as tragic as that of Ramanujan. She was the first Indian woman to get a medical degree, in the Women’s Medical College of Pennsylvania. Upon her return to India where she hoped to practice, she died of tuberculosis at the age of 22. Commenting on her life, the sociologist Meera Kosambi writes: Anandibai Joshee was a true pioneer…. she was the first Indian woman to qualify as a medical doctor. She was also the first Maharashtrian woman to leave these shores for higher studies abroad, at the young age of eighteen. In March 1886, when she received an American medical degree, she was barely twenty-one — an astonishing achievement in an era that refused even simple literacy to most Indian women! Anandibai chose a medical career because she wanted to serve other women who had inadequate health care. She defended this choice publicly and against heavy odds. Her personal life, too, was a continuous struggle on many fronts. Given the dramatic and eventful nature of her life, it is difficult to believe that she died so tragically young, just before her twenty- second birthday. [She was] an intelligent woman who was dispassionately perceptive of herself and her society — one who had independent views on contemporary gender issues. She was fearless in pointing out the obstacles to women’s education in India, and yet was firmly anchored to an Indian cultural and nationalistic identity. Anandibai was not merely India’s first woman doctor: she was also a feminist and a nationalist at a time when women were a rarity in the public sphere. And though she was not a scientist in the proper sense of the term, Anandibai wrote and researched in the field of public health/ epidemiology while still a medical student. Dear Sir, she says, I beg to ask, if upon any terms pecuniarily consistent with my means, I may be allowed to enter the Women’s Medical College of Pa. for a thorough course of study. I have with me seventy dollars, and my husband expects to send me twenty dollars per month less the cost of sending. I was eighteen years of age last March. I am not quoting the entire letter which can be seen in the archives of Drexel University, in their collection on Women Physicians, but the arguments she makes find an echo even today! Though I may not meet in all points, the requirements for entering College, I trust that as my case is exceptional and peculiar your people will be merciful & obliging. My health is good, and this, with that determination which has brought me to your country against the combined opposition of my friends & caste ought to go along way towards helping me to carry out the purpose for which I came i.e. is to render to my poor suffering country women the true medical aid they so sadly stand in need of, and which they would rather die for than accept at the hands of a male physician. The voice of humanity is with me and I must not fail. My soul is moved to help the many who cannot help themselves and I feel sure that the God who has me in his care will influence the many that can and should share in this good work to lend me such aid and assistance as I may need. I ask nothing for myself, individually, but all that is necessary to fit me for my work. I humbly crave at the door of your College, or any other that shall give me admittance. I’ve included a piece on Anandibai’s in Lilavati’s Daughters, a collection of essays on and by women scientists that I co-edited some years ago. Her story while sad and complex is compelling, and a perpetual testimony to the value of higher education, and to the importance of a higher cause. This entry was posted in Uncategorized, VC and tagged heroes. Bookmark the permalink. I am reproducing her very interesting “A MENTAL PHOTOGRAPH” written in Mrs. Carpenter’s Album at Roselle, NJ in Sept., 1883, by Anandibai Joshee. 4. Object in Nature? Mountains. 5. Hour? Sunrise and set. 9. Style of beauty? Perfection of form and manner. 10. Name, — male and female? Rama, Tara, Annie, Gopal, Vishnu, and Krishna. 12. Musician? Those who play on the violin and lyre. 13. Piece of architecture? The Taj Mahal. 14. Poet? Pope, Manu, and Kalidasa. 15. Poetess? Muktabai and Janabai. 16. Prose author? Goldsmith, Macaulay, Addison, Vishnushastree Chiploonkar. 17. Character in History? Richard Coeur de Lion. 18. Book to take up for an hour? The Bhagavat-Gita. 19. What book, not a Bible, would you part with last? The History of the World. 20. What epoch would you prefer to live in? The Present. 21. Where would you prefer to live? In Roselle now, hereafter in Heaven. 22. What is your favorite amusement? Reading. 23. What is your favorite occupation? Whatever is necessary to the common comfort. 24. What is your favorite trait of character? Sincerity. 25. What trait do you most detest? Dishonesty and infidelity. 26. If not yourself, whom would you like to be? No one. 27. What is your idea of happiness? Faith in God. 28. What is your idea of misery? To follow one’s own will. 29. What is your bete noir? Slavery and Dependence. 30. What is your ideal pleasure? To be rewarded for what I do. 31. What is your distinguishing characteristic? I have not yet found out. 32. That of your husband? Benevolence. 33. What is the sublimest passion? Love. 34. What are the sweetest words? Love, charity, truth and hope. 35. What are the saddest? Lost, forsaken. 36. What is your aim? To be useful. 37. What is your motto? The Lord will provide. This mental photograph is published in Caroline Wells Healey Dall, The Life of Dr. Anandabai Joshee, A Kinswoman of the Pundita Ramabai, Roberts Brothers, Boston, 1888. Read this book to have a fuller account of her remarkable life. If anybody wants it, I can mail the pdf file. Sure I will mail it in the evening. It is in my home computer. The book on Dr. Anandibai is written from the perspective of Christian missionaries, but has interesting letters by her.